This article written by Aseem Juneja and Jennifer Kumar first appeared in Mobility Magazine, August 2011. From slow economic growth in the West to a burgeoning Indian economy, there are a litany of reasons to explain the trend of Non-Resident Indians (NRIs) desiring to venture to India in search of employment. 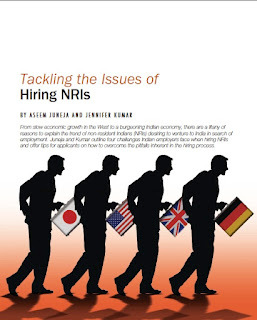 Juneja and Kumar outline four challenges Indian employers face when hiring NRIs and offer tips for applicants on how to overcome the pitfalls inherent in the hiring process. During the past few years, a trend of Non-Resident Indians (NRIs) desiring to settle back in India has become a reality for many. In preparing to return, NRIs often want to apply for jobs in India from abroad. Applying remotely for many jobs is often difficult whether or not it is in the same country or between countries. Many companies are wary of hiring returning Indians from abroad because of the following four reasons. Gone are the days in India when experience abroad demands respect. The employer needs to know what is it about your experience makes it worthwhile for them to consider you when there are so many in India that are already vying the open position. How to tackle this: Research the company well. See if it is a good fit for you and your experience. Show that you have done your homework. Assess if your experience not only matches their requirements but that you can bring something to the table that is worthwhile. Be ready to provide concrete examples. 2. The employer may be concerned about the NRI cultural adjustment period and how this will impact work. In addition to the initial adjustment phase of at least 3-6 months, wherein you will readjust to Indian culture, find a suitable place of residence and put down new roots (again), you will have to find your footing professionally. Though an NRI may have five, ten, fifteen or more years experience abroad, no one really knows about that in India, and may not care. They don’t know you. They don’t know what your strengths are. They don’t know how you have built up your reputation abroad. You will have to start all over again from scratch. Remember the “fish out of water” feeling you had when you initially moved abroad? That is most likely to happen again as you find your footing and rebuild your reputation in India. How to tackle this: Plan for your move well in advance; if possible, even a year or two ahead. Start by networking online. Connect to movers and shakers in your career field. Post things that will expose them to your business objectives and accomplishments. When the time is right, start reaching out to apply for jobs. Show humility and be humble. When interacting with prospective employers show them that you are serious and not overly aggressive about moving upward in the company. Demonstrate that you understand you will be a newbie, you will have a learning curve, but that you are willing to go the extra mile to learn quickly and adapt as required. Don’t forget as an NRI you have done this before. Remember how it felt then, step back in those shoes and try it again. 3. Employers are concerned about the applicant’s availability for interviews, personal assessments and how to hold video conferences across time zones. Employers also may not understand how to collect reference checks across cultures. The logistics of screening applicants abroad is tedious and often there may be no infrastructure within organizations to support this process. If the company has not dealt with foreign time zones or work cultures before, these things can hinder or prevent interest in hiring someone who is abroad. How to tackle: Clearly communicate your availability. If you have the opportunity to participate in conference calls or interviews via the Internet, inform them you will be available during regular business hours in India. If the meeting will happen by phone, offer to call them on your own dime. This shows determination and a willingness to accommodate them. If you have trips planned to India, clearly communicate this to the potential employer so they are aware you will be available for an in-person interview. 4. Most important – Indian employers are not really sure if you will make the transition back to India. They have to be satisfied that your reasons are genuine and you are serious. Many NRIs dream of returning and assume the readjustment will be easy because it’s their home country, they grew up there and know the culture and people. However, as you have changed during your time abroad, and the country you have lived in has seen change, so has India. India has not remained stagnant – it is rapidly changing. NRIs can and do experience extreme reverse culture shock because of this and quite a few stay a few months or a few years and end up going back abroad because of the inability to readjust. The process of cultural adjustment, not only at work, but at home, in daily life and in every other arena can seriously impact work. Employers want to know you are serious about returning to India and it is not just a fantasy that needs to be played out. How to tackle: Employ the help of your friends or family who have experienced moving back to India. Ask them about their experiences. Find out from them what was ‘easy’ to adjust and more importantly, what their challenges were and how they overcame them. Start to adjust your mindset to different expectations. It’s often the small things outside the work environment that can provide the most culture shock. Remind yourself why you or your family wanted you to settle abroad initially. What made life ‘hard’ in India and ‘easier’ abroad? How will this impact your adjustment back to day-to-day life in India? Day-to-day life is much different than the two weeks or two months stays many NRIs have had over the years. The adjustment will also impact you and your immediate family members differently if you have a spouse and children. Research educational options, health care, housing, and daily transportation needs ahead of time. Most importantly, have an overarching goal for moving back. The goal will help keep you focused and remind you of a bigger reason to keep moving forward when you are in the midst of culture shock and rebuilding your life back home. Author, Jennifer Kumar, an American based in Kochi, India, is a cross-cultural business consultant providing training solutions to Indians working with Americans. Contact her at for more information on corporate coaching and related business consulting solutions. What or who is an NRI? *Originally posted on this blog, Oct. 12, 2012.